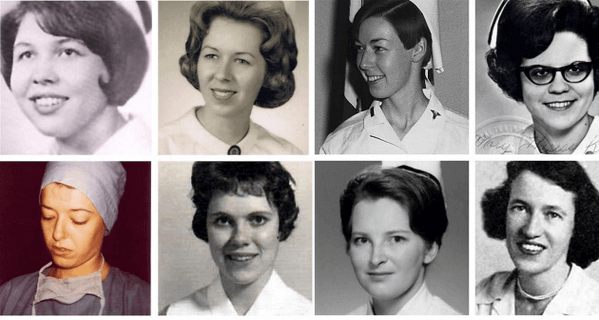 The names of eight women, all nurses (seven from the Army and one from the Air Force), are inscribed next to their fallen brothers on The Wall in Washington, D.C.
Each dedicated themselves to taking care of the wounded and dying. See their faces and remember their names. These are their stories. 1st Lt. Sharon Ann Lane of Canton, Ohio. 1st Lieutenant Sharon Ann Lane, U.S. Army was killed by a rocket explosion on June 8, 1969, less than 10 weeks after she arrived in Vietnam. Assigned to the 312th Evacuation Hospital, 1LT Lane was working in the Vietnamese ward of the hospital when the rocket exploded, killing her and her patients. She was from Ohio and her name can be found on Panel 23, Line 112. 2nd Lt. Pamela Dorothy Donovan of Brighton, Massachusetts. 2nd Lieutenant Pamela Dorothy Donovan, U.S. Army died of a rare Southeast Asian virus on July 8, 1968. Born in Ireland, she was assigned to the 85th Evacuation Hospital in Qui Nhon. 2LT Donovan is remembered on Panel 53W, Line 43. Lt. Col. Annie Ruth Graham of Efland, North Carolina. Lieutenant Colonel Annie Ruth Graham, U.S. Army suffered a stroke on August 14, 1968. She was from North Carolina and was the Chief Nurse with the 91st Evacuation Hospital in Tuy Hoa. Her name can be found on Panel 48W, Line 12. Capt. Mary Therese Klinker of Lafayette, Indiana. Captain Mary Therese Klinker, U.S. Air Force was part of an on-board medical team during Operation Babylift. Her flight was carrying 243 infants and children when it developed pressure problems and crashed while attempting to return to the airport. Captain Klinker was killed on April 4, 1975, just three weeks before the Fall of Saigon. A native of Indiana, she is remembered on Panel 1W, Line 122. 2nd Lt. Carol Ann Elizabeth Drazba of Dunmore, Pennsylvania and 2nd Lt. Elizabeth Ann Jones of Allendale, South Carolina. 2nd Lieutenant Carol Ann Drazba, U.S. Army was killed in a helicopter crash near Saigon on February 18, 1966. Born and raised in Pennsylvania, she is remembered on Panel 5E, Line 46. 2nd Lieutenant Elizabeth Ann Jones, U.S. Army was flying with 2LT Drazba and was killed in the same helicopter crash near Saigon. She was assigned to the 3rd Field Hospital. 2LT Jones was from South Carolina and is remembered on Panel 5E, Line 47. Capt. Eleanor Grace Alexander of Rivervale, New Jersey and 1st Lt. Hedwig Diane Orlowski of Detroit, Michigan. Captain Eleanor Grace Alexander, U.S. Army had been working in a hospital in Pleiku to help out during mass casualties from Dak To when her plane crashed on the return trip to Qui Nhon on November 30, 1967. She was with the 85th Evacuation Hospital. She was from New Jersey and is remembered on Panel 31E, Line 8. 1st Lieutenant Hedwig Diane Orlowski, U.S. Army was on board with Capt. Alexander when their plane crashed on its return trip to Qui Nhon. She was assigned to the 67th Evacuation Hospital, 1LT Orlowski was from Michigan. She is remembered on Panel 31E, Line 15. These eight women embody selfless love, sacrifice, and courage. They are American heroes who volunteered to serve their country. They joined the over 265,000 American women served during the Vietnam era. Approximately 11,000 served in Southeast Asia. Close to ninety percent were nurses. A small number of women served in civilian capacities, such as the American Red Cross and the USO. More than 50 civilian American women died in Vietnam. Others worked as physicians, air traffic controllers, intelligence officers, clerks and in other capacities. It wasn’t until November 1993 that the patriotic service of all women was honored in the nation’s capital at the dedication of the Vietnam Women’s Memorial. These women will be honored during the Military First Responders Tribute as THE WALL THAT HEALS visits Livingston County.